BEING ADMIRED BY HAIR-STYLISTS THE WORLD OVER. You can see here the documentary film "MIKEL LUZEA, 20 YEARS OF PASSION" his career, origins, and some of his personal life. 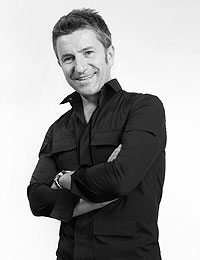 Hair-stylist born in 1967 in Pamplona (Spain), working in the profession for 19 years. In 1991 he moved to London, where he identified fully with British hairdressing and works in the different salons of the capital. Among his clientèle were included well-known figures of the BBC and MTV. In 1996 he moved back to Pamplona, where he opened his first salon and Mikel Luzea launched his career as a hairdressing company. From that moment, the most prestigious professional and fashion magazines in the world began publishing his work. Every year, his collections were on the covers of the world's magazines. He has extensive TV experience, as for years he appeared on programmes offering advice on how to change one's look. In 1999, his web page was premièred - one of the first hairstyling websites in Spain, and the first in the world to incorporate a live webcam to be able to observe the work going on in one of their salons. This attracted the attention of both the national and international media, who spread the news throughout the world. The www.mikel-luzea.com website is presently one of the most visited hairstyling sites in Spain. Proffesionals from the world over attend his international exhibitions. Mikel Luzea has a magnificent professional team to call on, he has worked for the leading cosmetic companies and currently works as an artistic adviser at an international level for the multinational company Revlon Professional. His creative works and his personal style are admired by hairdressers worldwide. In 2003, he opened his second salon, which, thanks to its innovative design, attracted the attention of a large number of industry magazines around the world, and published articles on the salon in their decor sections. In 2004, this salon won a design award granted by the Navarre Chamber of Commerce. October 2004 also saw his first appearance in the London ALTERNATIVE HAIR SHOW (the world's largest hairstyling event, where only the best are invited to participate - which he did with great success). On June 1, 2004, in London he won the GLOBAL SALON BUSSINES AWARDS (prize given to the best hair salon entrepreneurs worldwide) for his enterprising spirit in beauty salons. In January 2005, after several years of preparation, he presented the MIKEL LUZEA LINE - his own haircare products line. Mikel Luzea is already recognized as one of the most international Spanish hairdressers, and has participated again on four occasions in the London’s ALTERNATIVE HAIR SHOW, 2009, 2011,2013 y 2016. He is the founder of the Club Figaro and the Figaro awards (Spanish Hairdressing Awards) which has been running since its beginning in 2009, in 2017 his colleagues from the Club Fígaro awarded him the honorary Figaro for all his work in favor of the sector. In July 2011 he married Maria Perez de Ciriza, who has been his partner since 2006. In December 2012 he had his first son JON and in May of 2017 his daughter ARLET.